Another project preparing for the little guy. Scratch mittens, though difficult to keep on, are useful in protecting little faces from super sharp infant fingernails. Clark loved having his hands near his face, and we kept socks on his hands for about the first six weeks. As I look back through newborn pictures of Clark, I wish that I'd have made him some scratch mittens and skipped the socks altogether. 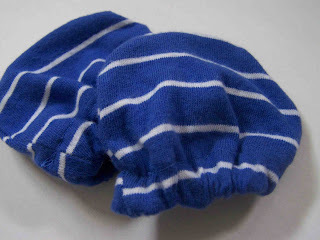 I found the tutorial and pattern for these mittens online, at Home Sweet Homebodies. Her pattern is for a double layered mitten, but I opted to make them a single layer of knit, it was quicker that way. 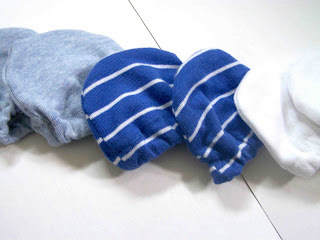 Both the light blue and the striped mittens are made from old knit shirts, and the white mittens are from some scraps of white knit that I had on hand. Maybe we won't even have to worry about using these when our little guy arrives, but I figured that I'd rather be safe and make a few pair. I'm thinking that I'm going to need to write up a post with links to all of the online tutorials and patterns that I've used preparing for this baby. I have at least one more project to share for the baby, but hopefully soon I'll be sewing for myself again. Always better to be safe and scratch-free! It's so sad to see the little scratches they give themselves with their sharp little nails!